It feels like Lucasfilm severely overestimated just how much audiences cared how the eponymous scoundrel got his name, met co-conspirators, or acquired the Millennium Falcon. 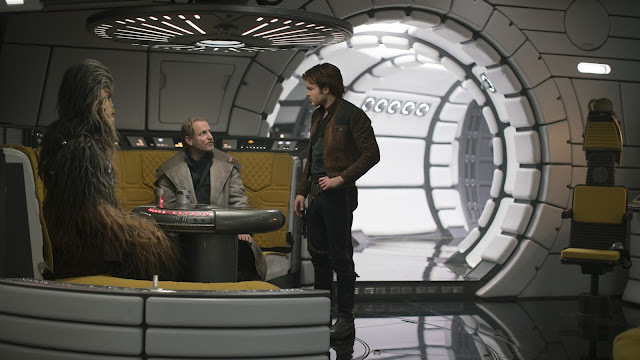 Solo: A Star Wars Story, the latest galactic non-"Episode", anthology film directed by journeyman filmmaker Ron Howard taking over the troubled production from original directors Phil Lord and Christopher Miller (credited as executive producers), is often a fun and dazzling origin prequel heist adventure sunk by its adherence to needlessly explaining already well-known character traits and servicing fans. Alden Ehrenreich stars with the unenviable and impossible task of embodying a young Harrison Ford with a ton of unearned charm but none of his original roguish demeanour. However, he always looks like he's having the time of his life but his ridiculous confidence and swagger feel unjustified as he's yet to accomplish anything. Nonetheless, his take on Han just never fits, especially with so many nods to the original portrayal. The rest of the cast is an intriguing mishmash of talented actors. Emilia Clarke is perfectly fine and charming as Han's love interest, Qi'ra, who conveniently shows up to be his adversary's lieutenant. She does her best but the character wreaks of the classic tragic first love archetype. A weary Woody Harrelson co-stars as Han's mentor, and again, is perfectly fine like most of the film's elements. Howard stalwart Paul Bettany, the only main character he cast himself, plays an intergalactic gangster with some devilish ticks and not much depth otherwise. Things don't really get good until Donald Glover and his scene-stealing Lando Calrissian shows up to engulf the film with his effortless charisma. He, alongside a lively Phoebe Waller-Bridge, brighten things up as Lando's quippy sidekick droid L3-37 has her own interesting arc. The whole film starts to come together to dramatize the famous "Kessel Run" after so much clunky exposition getting characters together. The fluid script from original Star Wars veteran Lawrence Kasdan and his son Jonathan Kasdan feels very standard with little twists, likely aided by Lord and Miller's original flourishes, and ticks a lot of boxes telling us how Han acquired different elements and his later trademark idioms. Yet somehow, the Kasdans gloss over his flight training and acquiring of skills like speaking alien languages and learning to fly despite being stuck on a desolate planet. The clear MVP of the whole endeavour is cinematographer Bradford Young as his crisp and inventive visuals evoke a grounded moodiness of classic cinema that serves the characters well. The shots, framing, and compositions make the outer space and planetary environments pop, elevating the otherwise bland heist antics, and gives some narrative context to the plethora of character double-crosses. Solo just doesn't stand on its own or stand out in general despite some endearing performances and impressive visual storytelling. Howard did his best to put together a cohesive and satisfying enough product from elements he had nothing to do with, but it just never quite comes together. The film simply never justifies its own existence as a standalone story. It feels totally safe but rather unimaginative and a forgettable rehashing of uninteresting trivia about the infamous character.